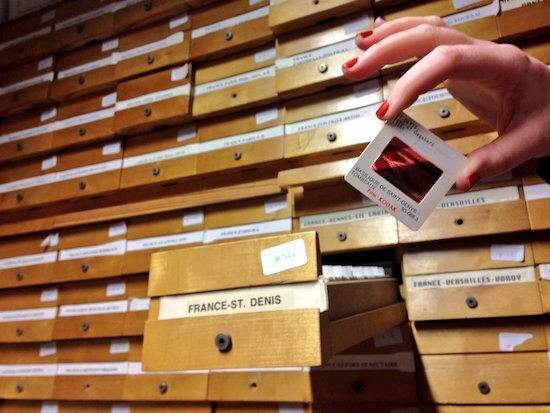 The History of Art and Architecture slide library at Trinity College, Dublin. Via the Department of Ultimology. Fiona Hallinan is an artist and researcher based at Trinity College, Dublin. She’s co-founder of a project along with curator Kate Strain called the Department of Ultimology. Ultimology is the study of that which is dead or dying in a series or process. When applied to academic disciplines, it becomes the study of extinct or endangered subjects, theories, and tools of learning. Long Now recently spoke with Hallinan when she visited The Interval. What follows is a transcript of our conversation, edited for length and clarity. LONG NOW: What was the inspiration for a department studying extinct or endangered subjects and theories? Fiona Hallinan: It began back when Kate and I were both alumni of the History of Art and Architecture Department at Trinity University College, Dublin. We learned everything we studied from a rather limited slide library. And we were speculating how in the last ten years those slides probably had been digitized, and students now probably had access to an infinite number of images compared to our limited selection. We wondered how that had impacted how people learned the discipline, and therefore how that had actually evolved the discipline of art history itself. So we came up with an idea for a department within the university that would examine all the other disciplines and departments from that perspective. Via the Department of Ultimology. We had encountered the term “ultimology” in the context of the study of endangered languages and thought that that could be expanded to become a general discipline across the university that looked at that which was dead or dying. 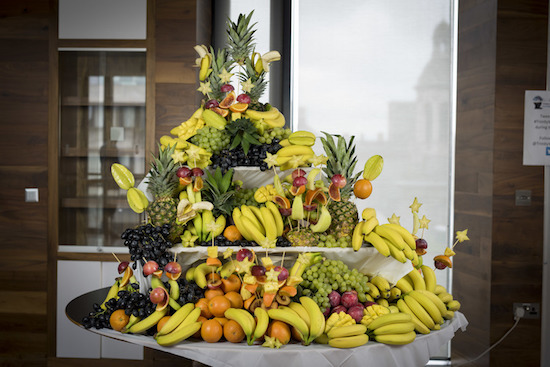 In 02014 we applied for and won the Trinity Creative Challenge, which was a provost’s award for artistic projects that would explore the university and present the knowledge being produced there to the general public. We spent the next year conducting interviews with different heads of departments and disciplines about what was ultimological in their disciplines. Based off of our findings, we organized the First International Conference of Ultimology, a public event that presented a mix of artistic commissions, presentations and real academic papers. Through that we were invited to be hosted as the Department of Ultimology in residence at CONNECT, which is the center for future networks at Trinity. LN: What is your methodology when approaching a given academic discipline? Are you reaching out to specific fields and subjects that you suspect as having ultimological potential? FH: At the beginning we just wanted to get as wide as scope as possible; we had a particular narrative that we expected to encounter, namely, that there was an increasing commercialization of the university because certain disciplines could receive funding that perhaps other modes of knowledge production could not on account of phasing out of interest and activity. We thought that a subject like, say, medieval architecture might be virtually impossible to get funding for nowadays versus something like computational linguistics. And as a result, this was causing a shift or change in the structure of the university. “The Illusion of Infinite Resources,” by the Department of Ultimology. While we did find that that was true to an extent, we also found that as a term, “ultimology” was really exciting for lots of the academics that we spoke to, and there was a sense of relief that finally there was somewhere they could put all of this endangered or extinct knowledge. Often, we would go into a meeting and people would be prepared with heaps of examples, whereas other times people would be interested but say that ultimology wasn’t really that relevant to their discipline, only to realize through inquiry that it was. One example of that was in Trinity’s Department of Psychology, where the department head, Dr. Jean Quigley, said that psychology didn’t really have anything ultimological because ideas and tools were added all the time instead of being taken away. We asked her for an example of something that had been recently added, and she described the concept of personality. From that, we asked what would the set of qualities we call “personality” been described as before. And she said that people would have spoken about the soul. So from that conversation we started to think about different methodologies, and we described that methodology as negative space—the space that the concept would have occupied before. A second methodology we developed was the idea of ultimology as a service. We hold clinics where academics come to us and speak to us, and the ultimological becomes a service akin to therapy where people can get things off their chest or they can talk about their research papers that didn’t go anywhere. It becomes a repository for the burden of the recent past. Another methodology we began to utilize was the idea of embodiment, where we embody the Department of Ultimology through commissioning artists to make us the accessories or trappings of a real department, like bureaucratic forms. Lanyards designed by Dennis McNulty for the First International Conference of Ultimology. Via the Department of Ultimology. For our conference, we found a company in Dublin that had a hundred remaining lanyards with mobile phone loops on them, which would have been used in the pre-smartphone age. 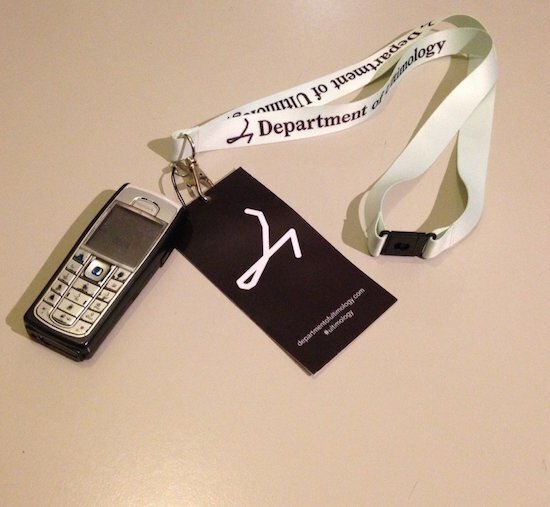 We commissioned an artist, Dennis McNulty, to riff on these lanyards with a poetic piece of text on them about the designer of the iPhone. The lanyard itself looked like an iPhone. And so there was this potential in an object like a lanyard that connoted a certain context and space of knowledge production, and I think there’s scope there to work with artists to consider those objects and what they mean and what their associations are for us. The bureaucratic questionnaire fulfills a similar function: it asks what research is, and talks about the idea of a person’s practice. While it looks very bureaucratic, its purpose is to get people to go deeply into reflecting on what they actually do. The performativity of being a “department” is essential. By doing it, it becomes real. While the Department of Ultimology is technically an art project, it’s not about just a specific outcome or a specific object coming out of it; it’s more about using an artistic process to re-evaluate everything critically. LN: What role does nostalgia play in the Department of Ultimology? Do the academics you interview bemoan a lost discipline or practice? FH: We try to be careful to avoid nostalgia, to avoid people being sad for something just because of a kind of fondness for it. While I’m not against nostalgia personally, I think it’s less interesting to fetishize the past, and more interesting to look at how these things actually affect the future. 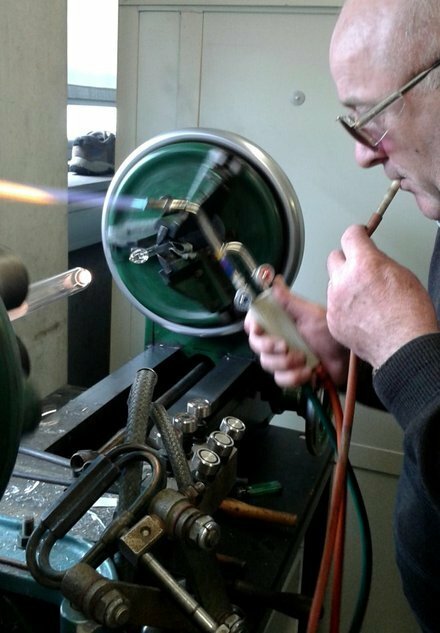 Glassware blown by Trinity’s resident glassblower John Kelly. John Kelly at work in his lab at Trinity College, Dublin. Via the Department of Ultimology. 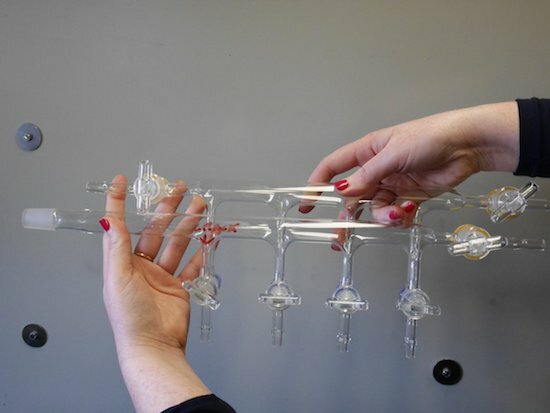 So while there’s a sense of nostalgia thinking about John Kelly in his lab and his beautiful glassware, it’s less about trying to preserve what he’s doing for the sake of it; there’s an actual reason behind it that’s important to know about. It’s also very short-term thinking. Say his salary is 50,000 Euro a year, and a piece of special glassware costs 1,000 Euro to ship in. it’s really quickly not going to add up, and is a short-sighted view of saving money now without much thought to the future. LN: Looking to the future, what’s next for the Department of Ultimology? 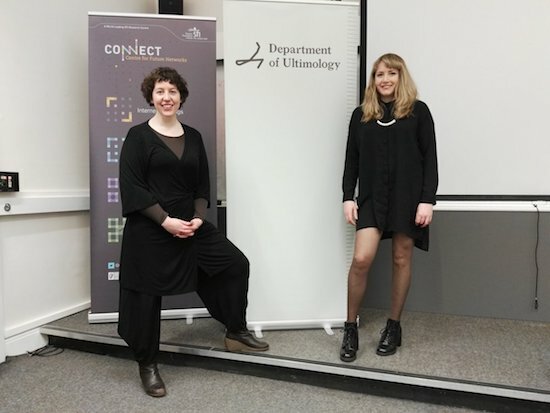 Kate Strain and Fiona Hallinan, founders of the Department of Ultimology. We’re hoping to publish a journal in December. We’re treating the journey of making it all as part of the project as well. So it won’t be a roll-out of a finished product, and I think that we might think of the field of peer review as potential for a public event. Ultimately, we would like to start a Department of Ultimology in every time zone. We say “time zones” because it’s a way of dividing the world that is perhaps more timeless than countries or nation-states. There’s an instability to those, particularly at the moment, whereas time zones have a celestial, larger-than-us quality. 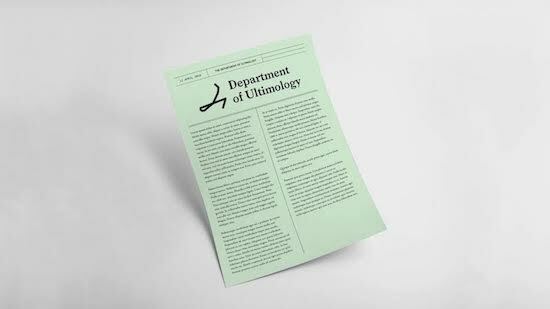 Keep up with the Department of Ultimology by heading to its website or following it on Twitter.